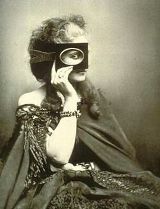 Virginia Oldoini, Countess of Castiglione, considered in her time to be the most beautiful woman in all Europe, introduced the fragrance to her lover, Napoleon III, winning him over to the Italian cause and the use of this cologne. She is so charming that at the French Imperial Court, all ladies follow her trends and above all emulate her use of Acqua di Genova. Fluent already in four languages and possessed of a most refined education, Oldoini's triumphant debut at the court of the Savoy Royal Family caught the eye of King Victor Emmanuel II who was conquered by her beauty, faultless elegance and charm. "Beauty in the eye of the beholden"
Virginia Oldoini, Europe's most beautiful woman. Photographed c1866.